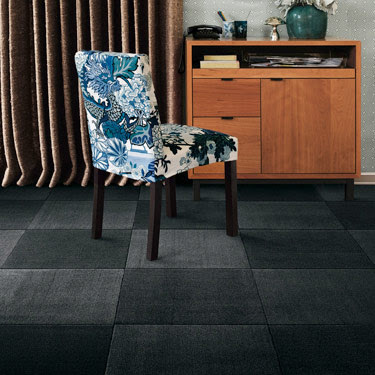 I've got to hand it to FLOR (you know the carpet tile people) and their style department- they do a pretty fab job making simple carpet tiles look awesome. I mean just look at this first picture, the carpet tiles paired with the beautiful Chiang Mai dragon chair is designer heaven, even if the tiles aren't. 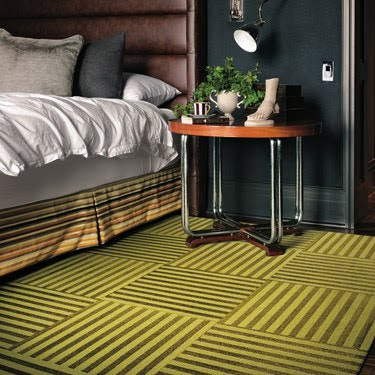 Love this green striped FLOR tile- the room looks kinda Nate Berkus to me- anyone else? 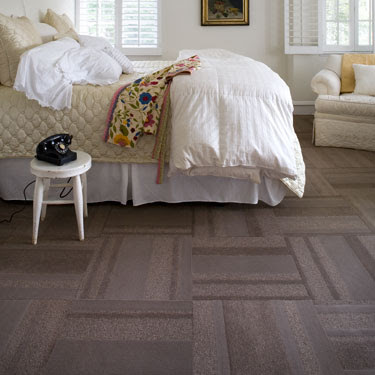 I wonder how these tiles hold up, or feel- have any of you ever used these FLOR carpet tiles and if so, do you like them?? PS- Thanks everyone for answering my question about the faux candles....I feel the same way all of you do. I really like the natural ones under the desk. Love the floral chair in the first image. Downside: they don't look polished because the edges are rough. 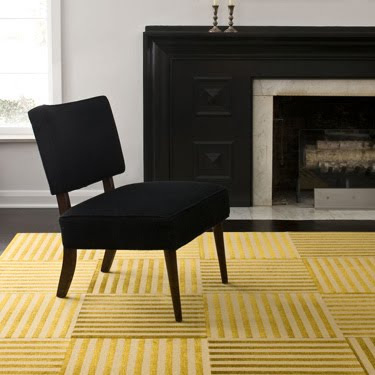 I think it really only works as a wall to wall carpet option and not as an area rug in any room you want to look polished. I really like the look of FlOR, too. I wonder how well they hold up. I've seen them in a few posts, but never tried them. I liked the yellow stripes! p.s. The floor tiles are the BOMB. I actually have only tried the commercial grade ones, but they are SO great. You can re-arrange, add to, so fun and perfect for ADD designer types. 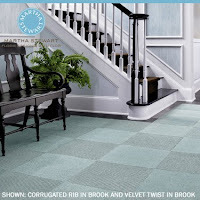 I'm still on the fence about them, but that seagrass-looking version done for the Martha line definitely has potential! We have our walk out basement done in Flor as well as an area rug in our entry. 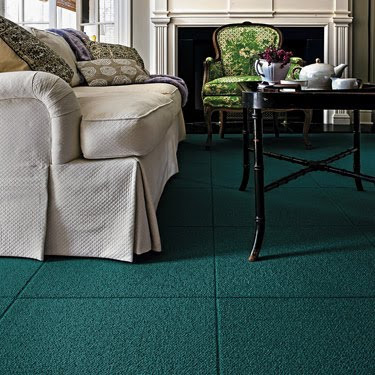 I love it - it adheres very well to the floor and doesn't move around. The FLor in the basement was their version for Lowes and was slightly less expensive. I've been thinking of trying them in our living room BECAUSE of the fact that I could take one of them up and clean it if one of our dogs has an accident. I think some of the designs look better than others... but they are a brilliant idea! ok i'm crazy about that green chair in the bckgrond of the one pic!!! and love your friend's dining room!!! love ours. have had them for about three years - they've made it through living area in a loft, then repurposed as an area rug in the master bedroom, then again as a smaller area rug in our living room. they still look great! 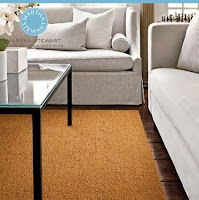 easy to clean and they totally adhere to each other/the floor and don't move around. mine look fine around the edges too. if you move them around a bunch (like we have) it is worth buying extra adhesive dots. for the $5 or so, it is worth it to be sure they stay put.